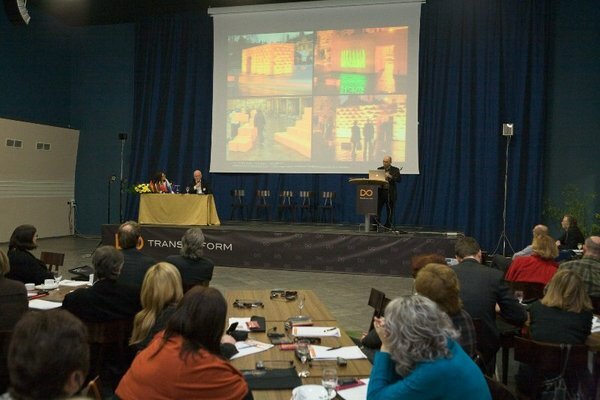 The first conference of Trans in Form project (hereinafter TIF) was held in Trakai on 17-19 February. During it the official start of the project was announced. The conference was attended by the participants from Germany, Lithuania, Latvia, Sweden, Norway and Poland. There also arrived guests from Russia and Belarus and experts from Italy and United Kingdom. These four criteria were carefully looked through during the meeting and they have become the key ideas. TIF is made up of three main parts. The first is the creation of cities’ development scenarios. Michael Fuller-Gee from Norway talked about the successful planning of the cities and new urbanism. The Expert shared his experience since he was one of the initiators creating a new image of Norway town Arendal town in Norway. After the realization of the integrated city’s development plan, in that the migration tendency has changed significantly. The second part of the project deals with investments and technical documentation. In this part all the participants will have an opportunity to formulate and implant technical documents for practicable investments in their town. The main purpose is to create new interactive public places. Town squares, fountains, parks are the places where people could meet with friends or just sit and rest. Places, which makes a city alive. Three participants of the project will realize the investments thus becoming as an example to prove how cities can change and beautify their towns. Three towns will be founded. It is Suwalkai (Poland), Jelgava (Latvia) and Tranemo (Sweden). The third part of the project is called new cities legends and histories. This part is also very important because image and individuality are both particularly important. Small towns and regions will be taught how to present itself in the international space in order to be noticed .This part will join together all the parts of the project thus interconnecting cities’ development strategy, practicable investments and partner’s image. A separate conference will be arranged for every part of the project, which aim will be to teach project’s participants how to realize project’s ideas qualitative. All the conferences will be lectured by professionals, who have international appreciation and experience. Thus all these activities will be concurrent from places the individuality of the places. Introductory, educational conferences will be arranged in Latvia, Poland and Germany. Another innovative part of the project will be the realization of “Attractivity barometer”. All the participants will be “measured” by particular criteria system related with cities’ attractivity in different spheres. This test will be made by Telemark research institute in Norway, which already had such experience in doing the same research in Norway in national level. Cities will get official information why they are exclusive, attractive or unattractive. This information will be important while creating histories, investments and presenting towns abroad. “Trans In Form” project’s length is 39 months. During this time the Baltic cities, the participants of the project could make an important start creating their towns or regions attractive. Hopefully, that this project will be successful and Alytus region will be one of those places.